New Online Mindfulness Course Launched! I launched my new online mindfulness course last week and thought I’d write a little blog about it. Not everyone can get to a group mindfulness course or afford to pay for one so I wanted to create an affordable online course experience that combined all the elements of group mindfulness based stress reduction and mindfulness based cognitive therapy courses. 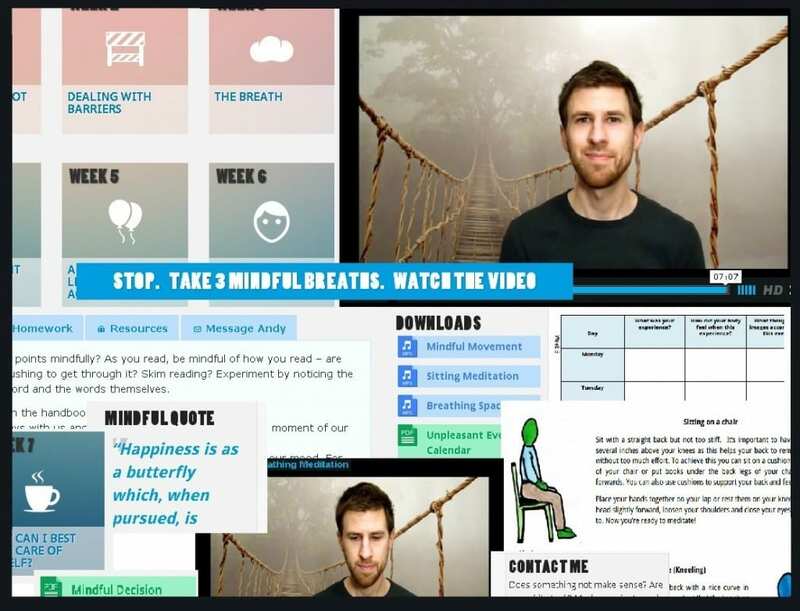 The key element I kept in mind while designing the mindfulness course was that it was supportive and interactive from start to finish rather than “off you go, best of luck!”. It’s not easy learning something new and mindfulness is something that takes quite a bit of commitment if you want to get the most out of it. To maintain the supportive thread and to make sure the course feels alive throughout, I’ve included daily emails that explore the themes of each week, a skype session half way through and email support over the 8 weeks. I’m delighted with how the finished course has come together. Feedback from the early participants has been excellent and I’m looking forward to supporting more people through the course! Here’s a sneak preview of some of the course content….